A long, long time ago in a game seemingly far, far away … the Giants hit a two-run home run. Actually, it was just July 6, and in San Francisco. But it seems like another galaxy. It came off the bat of Nate Schierholtz, a two-run shot in the fourth inning of the Giants’ 6-5 win over the San Diego Padres. Schierholtz would hit another home run that day, a solo shot in the bottom of the 14th that gave the Giants. Little did he know he would be starting a trend. With two more home runs in the Giants’ 6-0 win against the Pittsburgh Pirates on Tuesday, San Francisco has hit 18 consecutive solo home runs. One more and they tie the major-league record of 19 consecutive solo home runs sets by the 1914 Philadelphia Phillies. After Schierholtz’s 14th inning solo home, he was followed by solo shots by Eli Whiteside (on July 7 vs. Padres), Schierholtz (July 8 vs. Mets), Aubrey Huff (July 14 at Padres), Cody Ross (July 15 at Padres), Miguel Tejada (July 16 at Padres), Pablo Sandoval (July 18 vs. Dodgers), Brandon Belt (July 19 vs. Dodgers), Aaron Rowand (July 22 vs. Brewers), Rowand (July 26 at Phillies), Sandoval (July 28 at Phillies), Sandoval (July 30 at Reds), Ross (Aug. 1 vs. Diamondbacks), Huff (Aug. 1 vs. Diamondbacks), Whiteside (Aug. 5 vs. Phillies), Sandoval (Aug. 6 vs. Phillies), Chris Stewart (Aug. 9 vs. Pirates), and Huff (Aug. 9 vs. Pirates). Stewart’s home run was pretty cool. It was the first of his major league career. 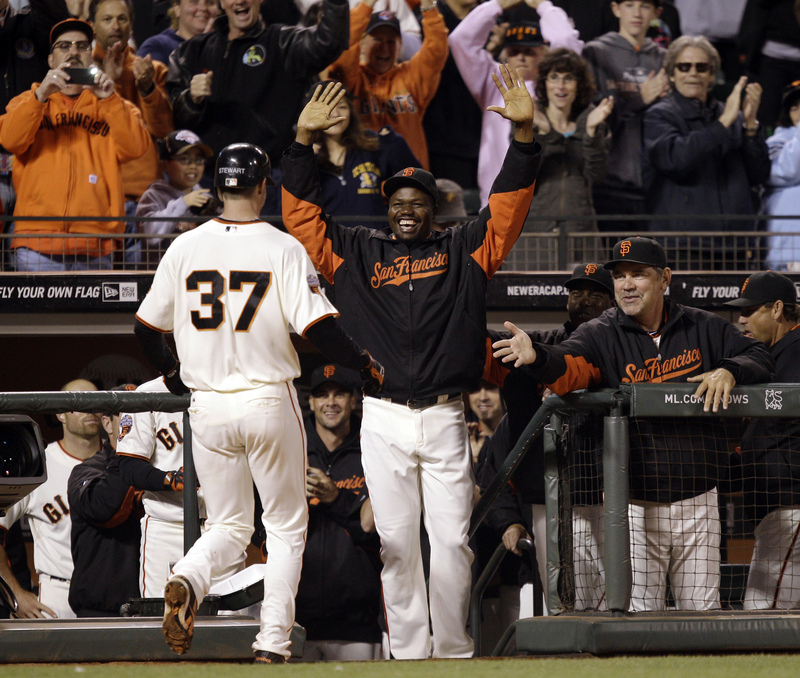 Stewart was greeted in the dugout by enthusiastic teammates, including reliever Guillermo Mota, who had to ask manager Bruce Bochy if that was Stewart’s first career home run. And if you like solo numbers, Tuesday’s game was only the second game since July 28 that the Giants managed to put up a crooked number in an inning. The Giants posted a pair of four-run innings in an 8-1 win over the Diamondbacks on Aug. 3. But other than that, the Giants had 17 one-run innings before plating three runs in the eighth inning Tuesday. So with one-more solo home run, the Giants will share the record. Maybe they could commemorate the moment by having a special guest throw out the first pitch? Might we suggest the goalkeeper of the U.S. women’s soccer team … Hope Solo? The old baseball adage says “speed never goes on a slump.” That’s good, because as Giants fans know all too well free-swinging hitters often go on a slump. The Giants snapped a four-game losing streak Tuesday by beating the Pittsburgh Pirates 3-2 in 10 innings despite failing to deliver a run-scoring hit. The Giants scored their three runs on two sacrifice flies and fielder’s choice — although a baserunner’s choice might be a better description. And that baserunner was Darren Ford. Ford entered Sunday’s game in the top of the eighth inning when manager Bruce Bochy put him in as a pinch-runner for Aaron Rowand, after Rowand opened the eighth with a single to left. Ford was looking to steal a base. And he was breaking to second when Freddy Sanchez hit a slow grounder to shortstop. However, with Pirates shortstop Ronny Cedeno covering second base, the ball was hit into the space vacated by Cedeno and into the outifeld, allowing Ford to race to third base. One out later, Ford scored the tying run on a sacrifice fly by Buster Posey. In the bottom of the eighth, Ford potentially saved a run when he ran down a ball hit into the right-center field gap by Matt Diaz. Off the crack of the bat, the hit looked like a sure double until Ford caught it … and made it look routine. In the top of the 10th, with Nate Schierholtz on second and no outs, Ford was asked to bunt Schierholtz to third. However, there were two problems with Ford’s bunt. First, it was bunted too firmly; secondly, it was bunted to first baseman Lyle Overbay. When bunting a runner over to third, the bunter should make the third baseman field the ball. But Ford bunted to Overbay, who threw Schierholtz out at third. Now, Ford was one first base with one out and looking to redeem himself with a stolen base. Pirates pitcher Joel Hanrahan was aware of that, but his pickoff throw was wide of the mark. It sailed up the right field line, and Ford was able to advance all the way to third base. That forced the Pirates to bring the infield in. Sanchez then rolled a grounder to second baseman Neil Walker, who froze Ford at third before throwing softly to first. Seeing that, Ford seized on the opportunity and raced home. A startled Overbay threw home, but his throw was late (and off the mark), and Ford scored the go-ahead run. We don’t know if Bochy’s comment was simply hyberbole, or it’s been simply too long since the manager has seen any displays of speed from his team. The Giants stole 55 bases last season, tied for 15th (i.e. last) in the National League. Andres Torres stole 26 of those 55 bases. TRIVIA TIME: Which Giant ranked second on the team in stolen bases last season? This season, the Giants are 9 of 15 in stolen base attempts and rank 14th in the NL. With the Giants severe lack of speed, Ford’s display Tuesday will leave many Giants fans calling for the team to find a way to keep Ford on the team for the rest of the season. To that MoreSplashHits says: Slow Down! Ford’s speed is definitely a weapon. But remember, he still has not collected his first big-league hit. He did have a single plate appearance during his September call-up last year. He is 0 for 5 with one walk this season. Speed is great, but it doesn’t do you much good if you can’t get on base. The Giants need Ford to develop as a hitter. He was off to solid start at Triple-A Fresno this season before he got called up to the bigs. This stint with the Giants could stunt Ford’s development at the plate. With Torres “a longshot” to rejoin the team the during this road trip, Ford will remain with the club at least until May 6. Until then, we hope to see more displays of speed from Ford. Because it was surely a sight for sore eyes of Giants fans. TRIVIA ANSWER: Aubrey Huff was 7 for 7 in stolen base attempts in 2010. The call of Giants fans to bring up Buster Posey from Fresno likely will quiet down a little bit after Wednesday’s 6-0 victory by the Giants over the Pittsburgh Pirates. Backup catcher Eli Whiteside had a good game both at the plate and behind as the Giants won the rubber match of the three-game series. Whiteside, who entered the game 1 for 7 this season, pounded a three-run home run in the second inning and he later added a double. He finished 2 for 3. And he caught a good game. Starting pitcher Jonathan Sanchez struck out 11 Pirates, while allowing just three hits in eight shutout innings. You’ll remember it was Whiteside who was behind the plate when Sanchez threw his no-hitter last July. Wednesday’s outing was possibly Sanchez’s best since that day last July. Whiteside was in the game because manager Bruce Bochy decided to rest Bengie Molina, despite his hot bat. Bochy is looking to rest Molina more this season, especially on day games that follow night games. The next day game that follows a night game comes Saturday at Dodger Stadium. But that is also the day Tim Lincecum pitches, and the Giants prefer to have Molina catch Lincecum. So we’ll have to see how that plays out. By the way, down at Fresno, Buster Posey is hitting .360. He started the season 9 for 18, but has gone 0 for his last 7. Fresno plays at Las Vegas Wednesday night. The power that the Giants were hoping to see from Aubrey Huff when they signed the first baseman showed up on Wednesday. Huff belted his first home run, although it didn’t come in the usual fashion. For the second time in three nights, Huff hit a ball deep into right center, normally where home runs go to die in AT&T Park. But this second-inning drive, hit off the No. 8 arch way and took a funky bounce back toward right field. By the time the Pirates got to the ball, Huff had rounded the bases and slid home for an inside-the-park home run. Huff also had a fly out to the warning track in center and doubled off the right-field wall on Wednesday. Brian Wilson struck out two while pitching a scoreless ninth. It was Wilson’s first action since Friday’s extra-inning win over the Braves. The Giants have not provided Wilson with a save-opportunity situation since the second game of the season. And that’s a good thing. There have been a lot of comfortable wins. For the second time in four games, a simple defensive mistake from shortstop Edgar Renteria contributed to a Giants’ defeat. Renteria dropped a throw from Jeremy Affeldt trying to turn a double play, resulting a no outs and leading the Pirates taking the lead in the eighth inning of a 6-5 win over Giants on Tuesday. With the scored tied 3-3 with one out in the eighth and runner on first, Affeldt got Lastings Milledge to hit a comebacker. Affledt fielding the chopper, spun and made a perfect throw to Renteria covering second. But in his haste to make a quick turn, Renteria did not secure the ball before beginning switching the ball from his glove to throwing hand, resulting in both runners being safe. Garrett Jones followed with a single to right scoring, Andrew McCutchen from second. The play seemed to lose some significance when the Pirates tacked on two more runs in the top of the ninth off Brandon Medders. But then Eugenio Velez’s two-run homer in the bottom of the ninth brought the spotlight back on Renteria. It’s also worth considering that had the score remained tied 3-3 after eight, the Giants likely would have sent Brian Wilson out for the ninth, instead of Medders, considering that a tie game after eight innings meant that Wilson could not be placed in a save situation. Renteria said afterward that he never saw the ball, and was just trying to protect his face. Nice try, Edgar, but we’re not buying that you lost the ball in Affeldt’s gotee. It looked pretty evident from the replay that he was trying to make a quick exchange of the ball from glove hand to throwing hand and simply muffed it. But fortunately for Renteria, there was more blame to go around. Third-base coach Tim Flannery gets some blame, too. With runners on first and third and two out in the fifth, Mark DeRosa shot a double down into the right-field corner, scoring Aaron Rowand from third. Then Flannery inexplicably waved Pablo Sandoval home. Watching the play live, you could see Flannery wave Sandoval home and automatically think “uh oh.” The next TV camera cut went to the Pirates cut-off man catching the ball and throwing home and you knew it wasn’t even going to be close. And it wasn’t. Not even the best shot from Kung Fu Panda to bowl over Pirates catcher Ryan Doumit could dislodge the ball and the Giants’ rally was over. The decision from Flannery was bad from start to finish. First, Sandoval is not the most fleet of foot and Flannery should have been able to see the throw would beat him by a country mile. It was the kind of decision you might see him make in the bottom of the ninth if Sandoval was representing the winning run. But in the fifth inning?!? If Flannery had put up a stop sign, the Giants would have had runners on second and third with thier hottest hitter — Bengie Molina — coming up next. Even if the Pirates decided to walk Molina, it still would have brought up Juan Uribe to the plate. Also a good situation for the Giants. Flannery’s decision also had another impact. It contributed to the premature departure of Giants pitcher Matt Cain. Cain struggled early in the game, falling behind hitters and allowing three runs in three innings. But then, Cain found his groove, setting down the last 10 Pirates he faced. And Cain had recorderd those last 10 outs with such efficiency that he was sitting at 86 pitches after six innings. He clearly could have come out for at least the seventh inning. However, in the bottom of the sixth, Molina led off with a walk. Uribe followed with a single, sending Molina to third. After John Bowker struck out — struck out in a situation which calls for contact of just about any kind — it forced Bruce Bochy’s hand. He opted to pinch-hit for Cain, sending Velez to the plate. Velez responded with a run-scoring groundout and the game was tied. But it also took Cain out of the game. There wasn’t much Giant fans couldn’t like about Monday’s win over the Pirates at AT&T Park. Barry Zito had another quality start, Bengie Molina was 4 for 4 with a walk, Pablo Sandoval 3 for 4. But if there is one Giant we’d like to shine a spotlight on, it is Aubrey Huff. Huff finished 2 for 2 with a walk and he was hit by a pitch twice. In the first inning after Aaron Rowand and Edgar Renteria reached and Pablo Sandoval popped out, Huff was hit by a pitch to load the bases. Mark DeRosa followed with a two-run single, and Molina singled home Huff for a 3-0 lead. It was the fifth 3-run inning for the Giants in just the seventh game of the season. Huff was on first base and Sandoval on second after Huff was hit by a pitch again. Mark DeRosa hit a liner to Pirates third baseman Andy LaRoche, who doubled Sandoval off second. If not for Huff’s alert baserunning, the Pirates may have turned a triple play. When Molina followed with a double, Huff rambled around the bases to score. In the sixth, the Giants mounted another two-out rally when Huff hammered the ball into triples alley for a triple, scoring Sandoval. Huff is hitting .280 on the season with no home runs and RBI. But with his four walks and now two HBP, Huff’s on-base percentage is .419. He has only struck out twice. His professional approach at the plate hopefully will have a positive effect on the lineup.